Heeft u een vraag voor Sandalwood Villa by Esmee Management? 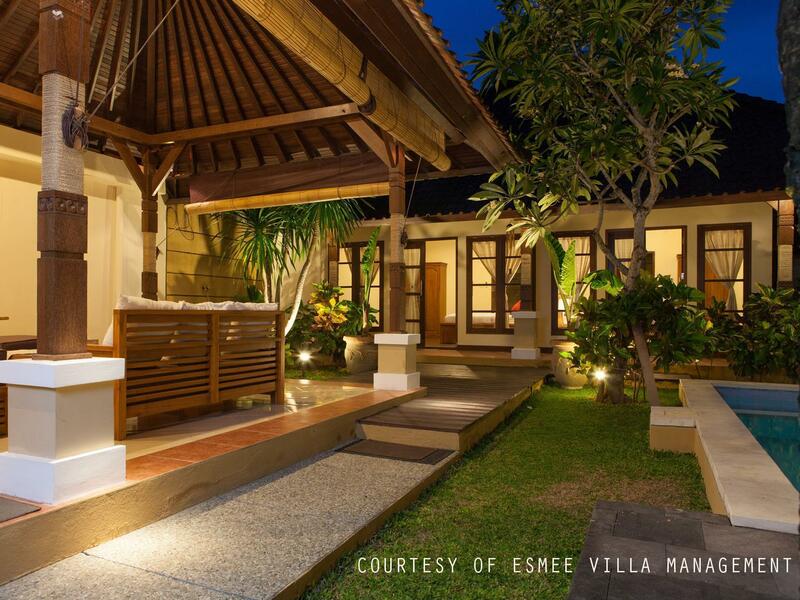 Goed gelegen in Seminyak, is Sandalwood Villa by Esmee Management het ideale vertrekpunt voor uw excursies in Bali. Vanuit hier kunnen gasten genieten van alles wat de levendige stad te bieden heeft. Dankzij de praktische ligging, biedt de accommodatie eenvoudig toegang tot alle belangrijke trekpleisters van de stad. Niets is te veel voor Sandalwood Villa by Esmee Management om het haar gasten naar de zin te maken. Zo biedt deze accommodatie de beste services en voorzieningen. Voorzieningen zoals gratis wi-fi in alle kamers, wi-fi in openbare ruimtes, parkeerplaats, roomservice, vervoer van/naar luchthaven zijn direct beschikbaar voor het gemak van iedere gast. De ambiance van Sandalwood Villa by Esmee Management weerspiegelt zich in de inrichting van iedere gastenkamer. plasma tv, kledingrek, oploskoffie, privé ingang, handdoeken zijn slechts enkele van de voorzieningen die u ter beschikking staan. De accommodatie biedt geweldige recreatiemogelijkheden die uw verblijf onvergetelijk zullen maken, zoals zwembad (buiten), massage, tuin. Met een ideale locatie en bijpassende voorzieningen, is Sandalwood Villa by Esmee Management voor veel gasten precies dát wat zij zoeken. There are several reasons not to recommended this villa: 1. There is no staff to help us out (only a person who came to open the gate for us to check-in and then he left) 2. The location way too far from downtown and not easy to find as there is no putting out the name of the villa until we call to property owner to find out where is their hidden villa. 3. Water in the toilet smells as hell. 4. Too quiet. 5. Small road to access to the villa. The price is amazing cheap for 2 bedrooms villa with private swimming pool, big living room, clean places, very friendly staffs, location is amazing. and i love the deluxe villa right in the end of their complex Sandalwood. Definitely i'll stay again anytime soon i go to Bali again. The Location is good, the pool is very small which max only 4 persons ( i booked villa for 3rooms). Overall this villa is a budget villa so don't expect anything. You only get what you pay for. It was unpleasant and embarrassing as I choose another villa initially and ipgraded us as the other villa was not available suddenly! This villa was dirty and unhygenic! Our christmas was ruined! Overall is good, but there is no staff around to help with our needs. The phone number is hard to be reach when we need help especially at late night and early morning. First of all I got double booked, so I was moved to d'Nata Villa. overall it's a beyond expectation quality that I got given the price that I paid. Totally recommended! Average stay and suitable for budget travellers. Disappointed with the pool and a lot of mosquito. Suggest to clean the pool before guest check-in. Good villa but it's a long walk to the main shops and nightlife of bali. Plus its really hard to find, there is no clear signage out front. It took some help from some locals to point me in the right direction. We booked the villa for two nights but forgot to mention early check-in. But when we arrived (after midnight) and spoke to the staff, he was kind enough to let us in to the room whilst they clean the area (since they were surprised by our early check-in). He even woke some of his staff up to quicken the pace. Area was spotless in less than an hour. Villa was as what it is in the pictures- clean, big and beautiful. However, do note of the mosquitoes. The staff gave us some leftover repellents to burn which helped greatly. Location was also good. Near to the Sunset Road. Just 10mins ride to Kuta and Seminyak beaches. Nearby Kmart provided easy access to late night snacking. It was overrated as there was a lot of mosquitoes & bugs etc. On top of that the interior are a bit old and not well maintained/clean. Missing mirror in one of the bathrooms, no toiletries/hygiene set provided as I did not bring my toothbrush. Towels are dirty although its new. Floors at certain areas are sticky too makes you feel you do not want to step on. I booked my villa with breakfast but the staff said have to check although eventually we got it. The staff was also pushy regarding transportation options available. If you do not need to stay here, you really don't have to. The place itself, location and service. Had a good time. Will definitely come back. The beds were clean. It was close to the airport. Good wifi connection. You get back less than what you pay for. Staff we're late in getting us the keys to check in, we had to get our private driver to call them as the office/ "help desk" is not at the villa. There were tons of millipedes crawling into the shower area because the shower is outdoor and I had to use the shower to flush them away every 5 minutes; and some even crawled into the pool. The tub had mold all over and was disgusting to look at. The kitchen area had stains and was not clean and the staff did not replenish the baygones and mosquito repellents when we first checked in. Overall cleanliness and service of the staff were poor. Only good thing about the stay were the clean beds, good wifi and proximity to the airport. good location. 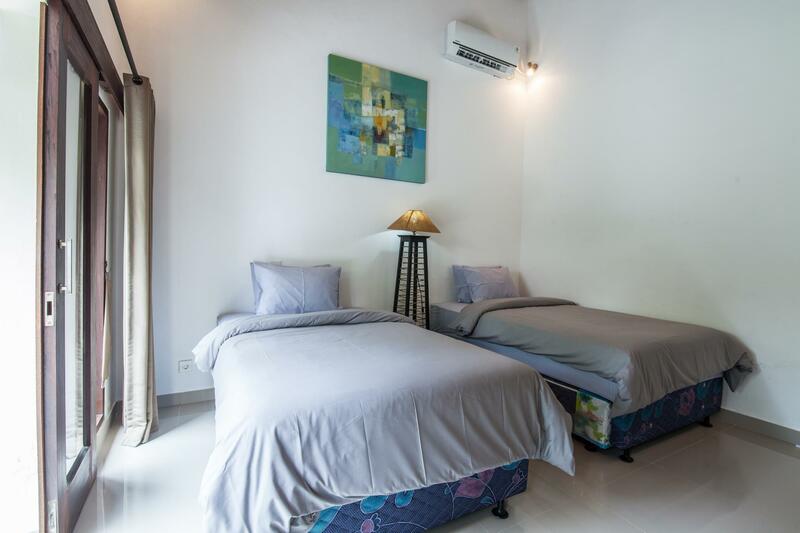 Very comfortable for family stay. Value for money. Very nice accommodation for family or friends, we had a lovely time in the villa. Pool and the villa is private, we could order some food in the villa from the restaurants next door, location is quite, staff is friendly and villa is clean. Stay was pretty pain free - comfy rooms, clean pool. The villa has the usual wear and tear - sinks don't drain well and the water dispenser buttons keep getting stuck - but overall they keep the villa tidy as someone comes to clean and change towels every day. Location is great -just off sunset road, and not far to the main drag of Seminyak (20 minute walk, 5 minutes drive) the road leading there is very dusty as there is loads of construction. If you are planning on sleeping early this may not be a great villa for you as the bar behind plays music loudly till about 1am. Parking on site, very convenient for those with car. Don't forget to pack mosquito repellent and have a nice holiday. Basic and dated but you get 2 bedrooms, 2 bathrooms, pool and kitchenette. Pretty good value overall. There were literally dozens of, aggressive, mozzies in the (open) kitchen/lounge almost to the point of unpleasentness. A few little hiccups at check in, nothing too serious... nobody there to open up when we arrived, no wifi modem, TV not working, but all sorted pretty quickly.